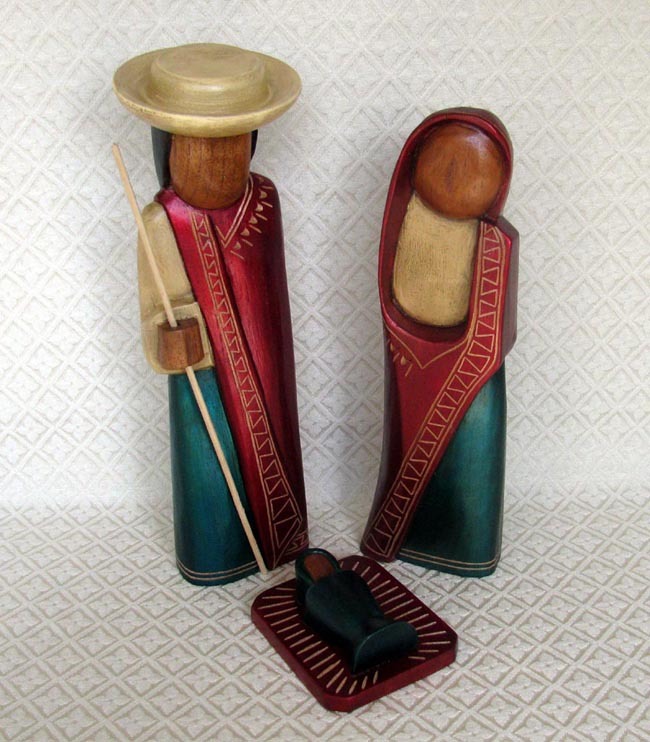 This tall Holy Family is hand-carved from cedar wood and then hand-painted. The carving was made by Otavalo Indians in a style that represents their traditional clothing and culture. The artisans work in the village of San Antonio de Ibarra, Ecuador. This town is famous throughout Ecuador for its fine wood carvings. The Joseph figure stands 12 inches tall. The carving workshop was started in March 2006 by three sisters: Teran, Martha & Margarita. They started teaching a group of workers who had no experience in woodworking; the workers developed great skill so now they produce many styles of Nativities. The workshop employs up to16 people, depending on the season.